Jean-Luc Picard is a Star Trek: The Next Generation character. Patrick Stewart played as Jean-Luc Picard. He was the captain of the USS Enterprise-D, and later of the USS Enterprise-E. He was born in la Barre, France, on Earth. He had a brother, named Robert Picard. Jean-Luc was proud of being French. As a character, Picard is very similar to James T. Kirk, albeit slightly older. While Picard is understood to be French, Kirk is of Irish heritage. Both require equal discipline of their crews, but are also fair toward them. Both are ready to sacrifice themselves for their crews when need be. 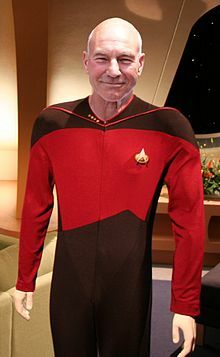 Their encounter in the movie Star Trek – Generations gave the surviving Picard a great deal of newfound strength to carry on his demanding mission. Picard was also known as Locutus of the Borg in the episodes "Best of Both Worlds" 1 and 2. This page was last changed on 12 February 2015, at 11:12.